Faithful blog readers may remember this post, as it’s that time of year again . . . Instead we arrived at their house. Auntie Elaine (according to British habit, all family friends were “Auntie” and “Uncle” to us kids) finished up dinner preparations while we helped set the table. And then, instead of sitting down to dinner, she asked Helen and I to come and sit with her on the couch–“Anna, Helen–I have some really sad news . . . your Daddy went to heaven . . . ” Before the sentence was finished, I had burst into loud sobs, Helen looked at me and started crying, and Auntie Elaine and her daughter were both crying and hugging us. On this day, when we were children, Mom beautifully commemorated the anniversary. She would buy what looked to me like hundreds of helium-filled balloons, bringing them home so that the house was bursting with balloons. Then she tied note cards to the string of each one, and told us to write notes on them–as many as we wanted, and whatever we wanted to say to a stranger. I remember writing things like “Jesus loves me this I know . . .” and “My Daddy died on this day, and he is now in heaven with God, because he loved God. I do too.” I wrote silly notes, but meaningful ones, longing, in all my childhood intensity, to somehow tell the world that I had a great Daddy, and that some day I would see him again. I still catch myself, when I am still enough to listen to the deeper desires of my heart, craving moments of remembrance of my Daddy, and eagerly clasping to memory any tidbits about him that people from his past may be able to share with me. And thankfully, my own mind clamped down firmly on all the memories I had of my times with him, out of a personal need for them and, I suspect, out of a nagging suspicion that someday, somehow, there would be a greater use for, outlet for, it all. and now, for some utterly mindless fluff . . .
honorable mention . . . When in decorating or furniture rearranging mode, I tend to climb on anything that looks reasonably likely to hold me. This morning I had a gift from China–a lantern presented by some Chinese guest speakers–and found the perfect spot to hang it. 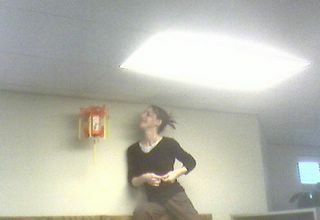 The only downside was that this perfect spot required getting to the high school ceiling in order to do so. So I crawled up the library bookshelves and thankfully found them sturdy enough for me to perch long enough to jimmy a hook out of a paperclip in order to . . . raise the red lantern? Spying an unexpected motion out of the corner of her eye as she passed the library, one of the teachers came in and stared for a moment before making some sort of a comment about how it is not every day that one gets to witness a levitating librarian. And then using the only camera available–a cell phone–she snapped this shot, as visual proof, I suppose . . . Yesterday an envelope arrived in my mailbox with a return address that made me hesitate to open it: The Embassy of the Republic of Zambia . . . I sort of hesitate to write this, feeling a bit self-conscience about my bundle-of-contradictions-self, but . . . I get annoyed by voting coverage, I despise campaign ads, I hang up on solicitation phone calls, I turn off NPR’s coverage when normally tuning in as an NPR addict . . . But before the polls opened this morning, I was there. I was eager as I confidently filled in the bubbles on my ballot, thrilled to be standing in line with my district neighbors, flashing my voter registration card, signing my name . . . and casting my vote. Is it odd for someone as relatively abnormally-citizened as I am to be so passionate about a normally-patriotic citizen duty?